Les Hanois lighthouse is situated in the Channel Islands and belongs to Trinity House. It was the first lighthouse on which STORMLAMP conducted modal testing on 1 June 2016. The logistics involved driving a van load of equipment via car ferry to Guernsey, the second largest of the Channel Islands, and flying by helicopter, landing on the helideck atop the tower. 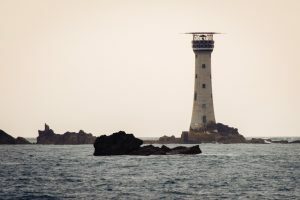 Built in 1862 and of fairly modest height, 36 m, the tower marks reefs off the Island of Guernsey.